Home→Latimer: Consequences for Westchester Development of Con Ed Moratorium on Gas Hookups in County Dire. Extending March 15 Deadline Sought. County & Business conservation of Natural Gas Usage Proposed for Efficient Use Existing Gas Supply. 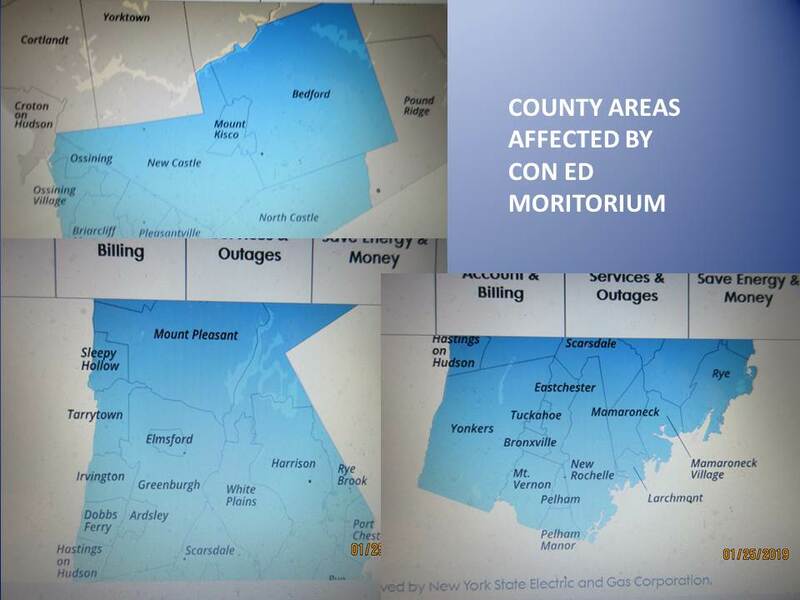 Latimer: Consequences for Westchester Development of Con Ed Moratorium on Gas Hookups in County Dire. Extending March 15 Deadline Sought. County & Business conservation of Natural Gas Usage Proposed for Efficient Use Existing Gas Supply. County Executive George Latimer this morning outlined how the county would proceed in seeking to work to find solutions to Con Edison, the major electric and gas in Westchester County, putting in place a moratorium on new natural gas connections in Westchester County over 2/3 of the county. He announced the county would seek an extension of the March 15 deadline for applications for new connections with the Public Service Commission. He announced the formation of county and business groups to identify ways natural gas demand could be conserved to allow continued development. In tandem with that across-the-board reach out, Mr. Latimer said he would direct all county departments and municipalities to find how the county could cut down its use of natural gas. He said he would work cooperatively with Con Edison to identify ways to cut natural gas demand to allow allocation of Con Edison limited natural gas supply. WPCNR asked Mr. Latimer If the the Con Ed 6 % rate increase for electric and 11% for gas, primarily targeted for “infrastructure improvements,” as stated in the Con Ed news release (reprinted in the preceding article below), announcing the increase last Thursday would be devoted to increasing the availability of natural gas, and Latimer said Con Ed did not plan the rate increase revenues to improve availability of the gas supply. Noam Bramson, Mayor of New Rochelle, told WPCNR as we were exiting the news conference, said that was important to know that Con Edison infrastructure within the county was not an issue, instead it was the availability of natural gas through either another pipeline leading into the county to bring in more natural gas was the issue behind the moratorium. Bramson added that the more crucial date concerned when gas installations presently approved had to be connected to any facility being built, which he said was two years away. That date, approximately March of 2021, he said put present developments in jeopardy. Tom Roach, Mayor of White Plains, told WPCNR that all of White Plains present “approved” projects were not subject to the moratorium, their gaslines already approved. (WPCNR requested a listing of the approved projects. WPCNR believes they are The Broadstone, The Continuum (second building to come), 440 Hamilton Avenue renovation, the White Plains Pavilion project, (approved but awaiting redesign), Esplanade renovation, Projects that may be affected are the White Plains projects on Bloomindale Road and Westchester Avenue . Recent projects that may be affected by the moratorium are the four forthcoming White Plains MetroNorth properties, which have no designs or projects yet proposed, the Martin Ginsberg project recently introduced, and the Good Counsel Property development current in an environmental evaluation and not approved yet. Asked by WPCNR if the Public Service Commission had indicated how Con Edison and NYSEG would hold accountable the two power companies for their severely criticized performance in restoring power last March, Latimer said the county would be meeting with PSC next week, but at present time he had knowledge of PSC decisions on whether to discipline the two companies or not. Mr. Latimer said he would be sending Joan McDonald, Director of Operations to Albany to discuss the possibility of extending the moratorium deadline. Asked by WPCNR if he supported the Con Edison rate increases, Latimer said no decision has been made on that issue yet, and it was in the process of being evaluated. Here is the WPCNR video of the complete news conference, hastily called this morning. · Working with the business community, and other entities, to help them navigate this moratorium and how it relates to development.